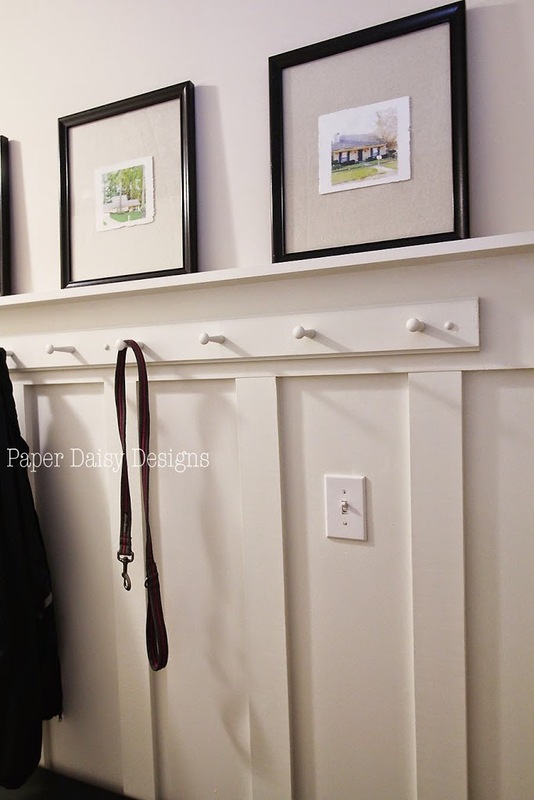 Want to transform a boring hall into a practical, useful and beautiful space?Board and batten is the simplest answer to add charm and interest to a basic wall. 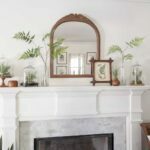 In the same way crown molding adorns the ceiling of a room and chunky trim adds depth, board and batten is the classic and straightforward solution to a plain wall. 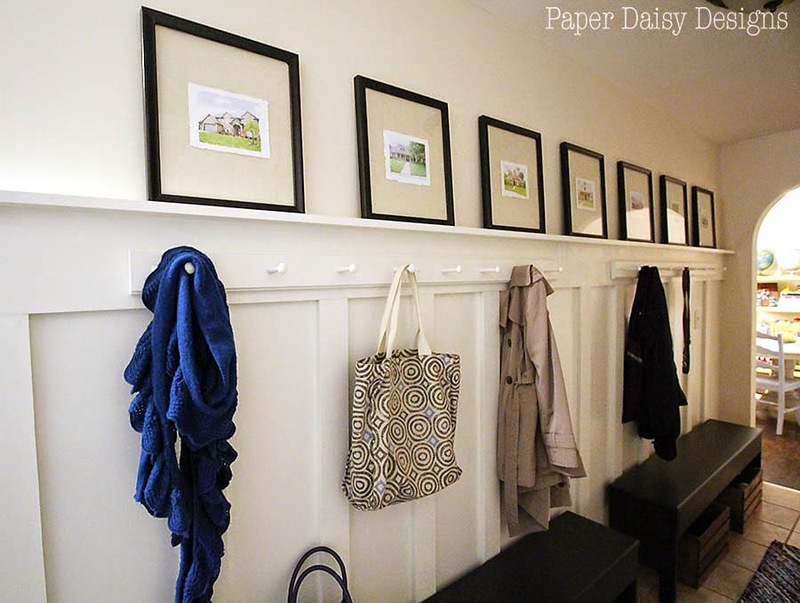 Add functional hanging pegs, a place to rest, ample storage and you’ve created yourself a mudroom hallway. I know you have read board and batten tutorials before, but speaking from experience, it is honestly a beginner, super easy project. Everyone seems to have different approach to board and batten, varying not only in materials, but also size and spacing of the batten boards. I think it’s a just a personal preference, but I have one very unique tip to share. Keep reading! 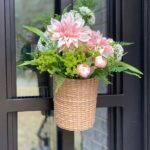 Today, I’d like to share how we completed the project. I dare say this project was even fun! 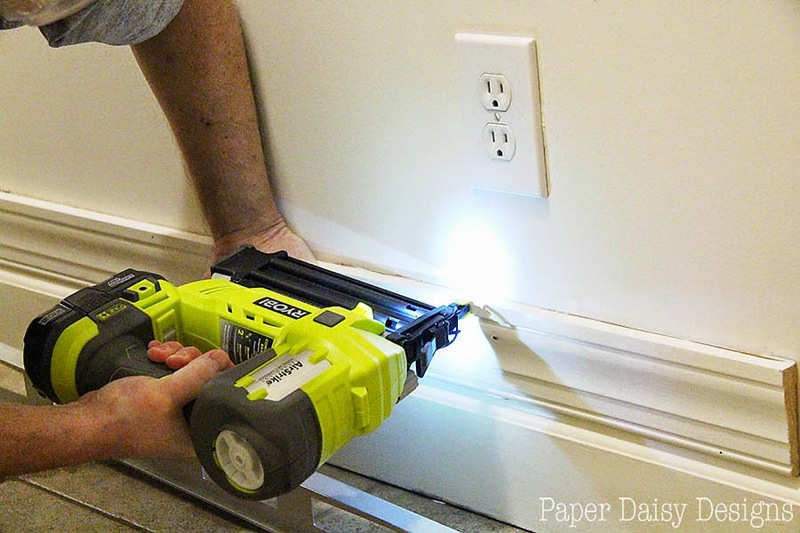 My husband and I were like little kids fighting over who would use the Ryobi AirStrike Brad Nailer. Let’s get to the how to shall we? We decided to begin with a sheet of PureBond Plywood from Home Depot. 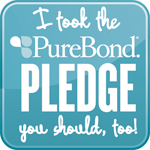 I love that PureBond is formaldehyde-free and is a hardwood plywood. We also used a higher grade of wood for our horizontal pieces because they tend to be straighter and have less warping. 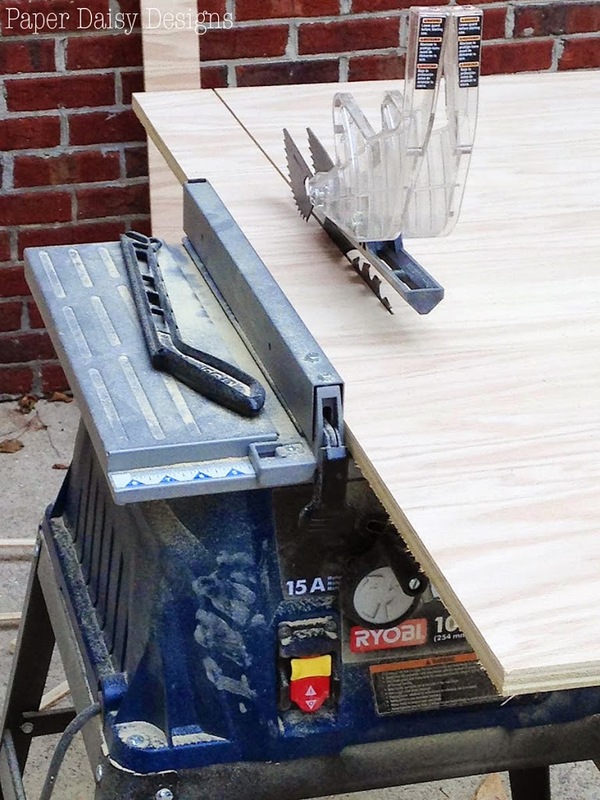 We had the plywood cut to (2) 35″ x 4 ft sections, plus the leftover, so that it would fit easily into our car. You could also have Home Depot rip all your cuts, but we chose to bring them home and cut them ourselves on our table saw. I wanted the boards to be a little chunkier than most versions of board and batten I had seen, finally settling on 3.5″ wide. Here’s what the boards looked like all cut and ready for primer. My husband, Richard, cut the boards while I was away for the weekend, but he said it went super fast. We hadn’t decided on our exact plan for spacing at this point, so we ended up using only 12 of these boards. When I returned, I primed all the boards and we got ready to assemble. 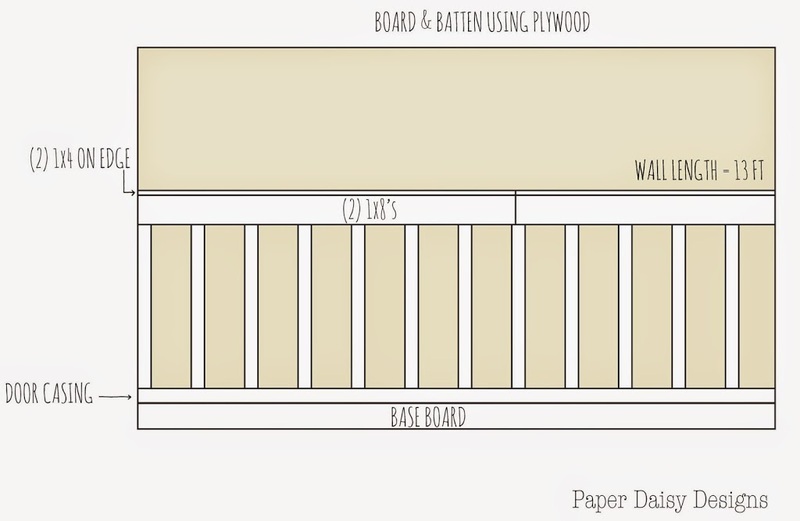 Here’s a diagram of our construction of the board and batten and a description of the wood pieces we used. The most unique element of our board and batten is I chose to use door casing as a transition board from the baseboard for two reasons. The first was simply an issue of recycling; we had some door casing in our wood pile left over from the installation of a new back door. 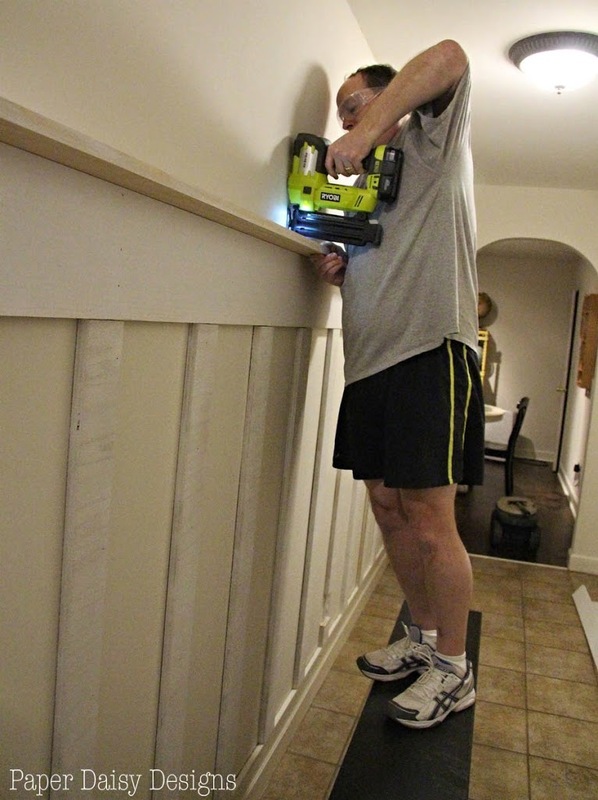 The second was, when the trim was flipped so that the inside of the casing met the baseboard it was a similar depth. Conversely, the outside of the casing matched up perfectly with the depth of the plywood for the batten strips. 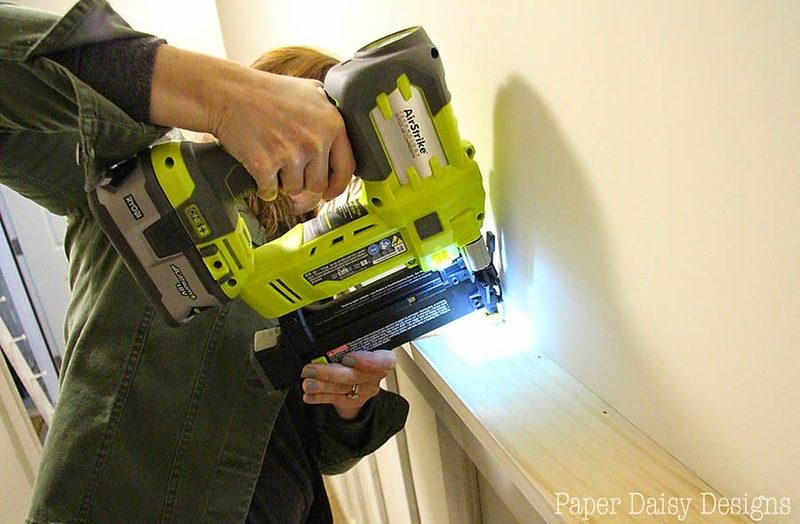 Before nailing anything, we found the studs using the Phone Works Stud Finder by Ryobi. 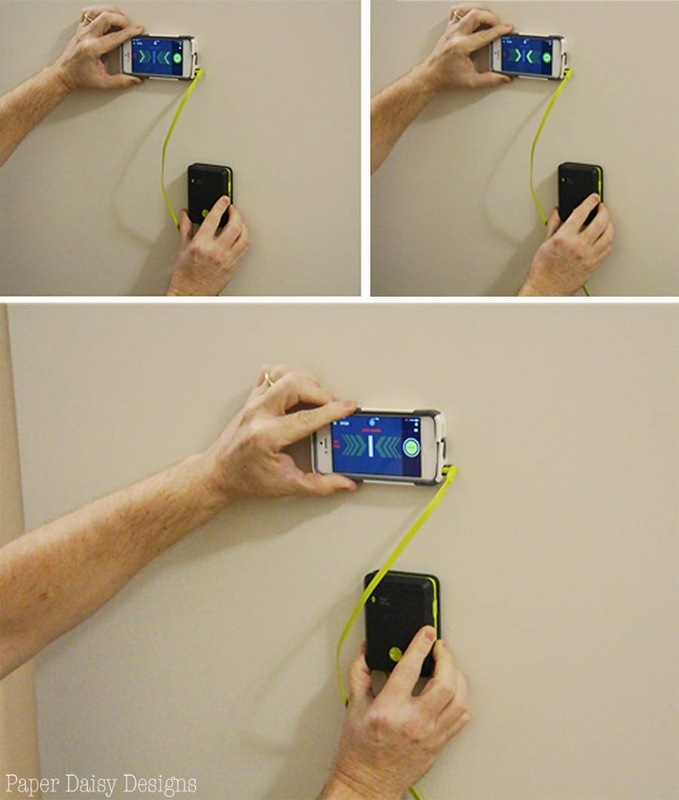 This handy device tethers to your smart phone. By using the display on your phone, it clearly indicates where the stud is located. Once you find the stud, you simply push the little green button at the bottom and it will make a pin point mark on the wall. We loved this thing!! Then we began nailing our trim. 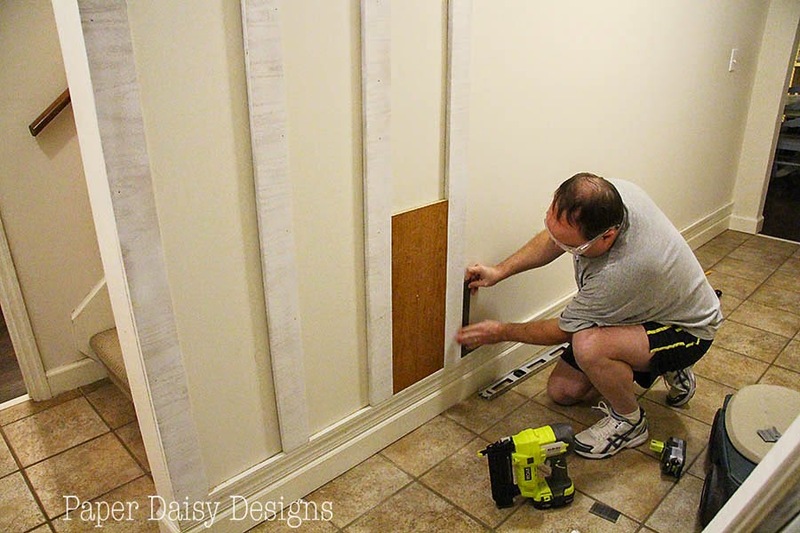 You can see how the door casing creates the perfect transitions between the baseboards and the battens. Next we started attaching the batten boards. They went up quick! We absolutely loved the nailer. It was so much easier to use then our old nail gun attached to a compressor. Sometimes the boards met the studs sometimes not. They don’t support any true weight and each board is fairly light, so no big worries. We were sure to use our marks for the studs on all horizontal pieces. To make the spacing between the boards almost effortless, we used a scrap piece of wood that matched the desired space between the boards, 9 3/4″. You will want to make sure your scrap is perfectly level and straight. This was a simple check with an L square, repeating this process for every board. 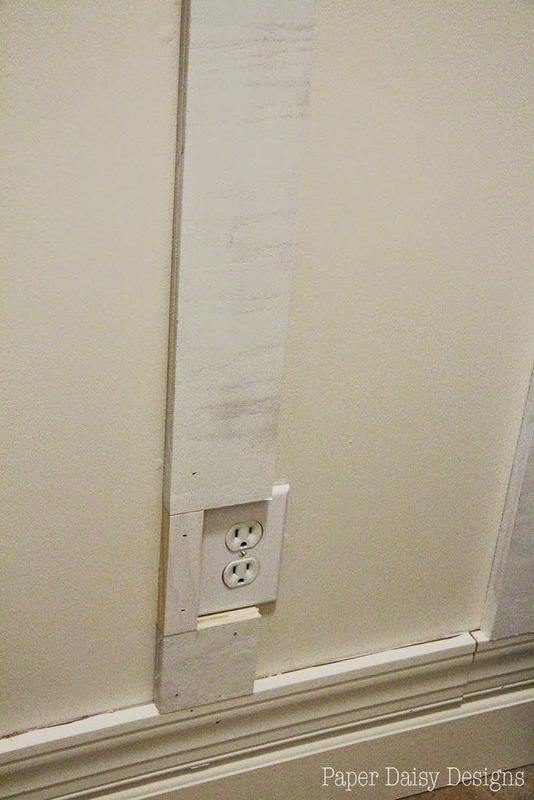 When we reached the wall outlet, we chose to simply build around it. Next we added the 1×8 boards along the top. And this is where I must confess that my dear husband was right. He had suggested we should hang the 1 x 8’s along the top before we hung the vertical boards. If we would have done as he suggested, there would have been less putty work for me at the end. We could have lined the top of the boards up perfectly and left the less than perfect joints for the bottom. Hindsight is always 20/20 as they say and that’s also where having someone go before to learn from their experience is beneficial. After the 1 x 8’s were up, we nailed the 1 x 4’s to the top edge to create a ledge. To nail the board in as a ledge, you need to go in at a bit of an angle to insure that you don’t misfire and have a nail come out through the 1×8. I finally pried the nail gun out of his hands and handed him the camera! Because our wall was longer than the boards we were using, 13 feet or so, we sent a nail into the 1×4 wood diagonally where they met for extra stability. Also in hindsight, we should have trimmed off the ends of our 1×8’s to make them square. A little wood putty did the trick to fix the top where the seams of the two boards didn’t meet perfectly. Speaking of putty, after the boards are all hung, putty and caulk are your best friends. I used caulk along the edge of each board along the wall. 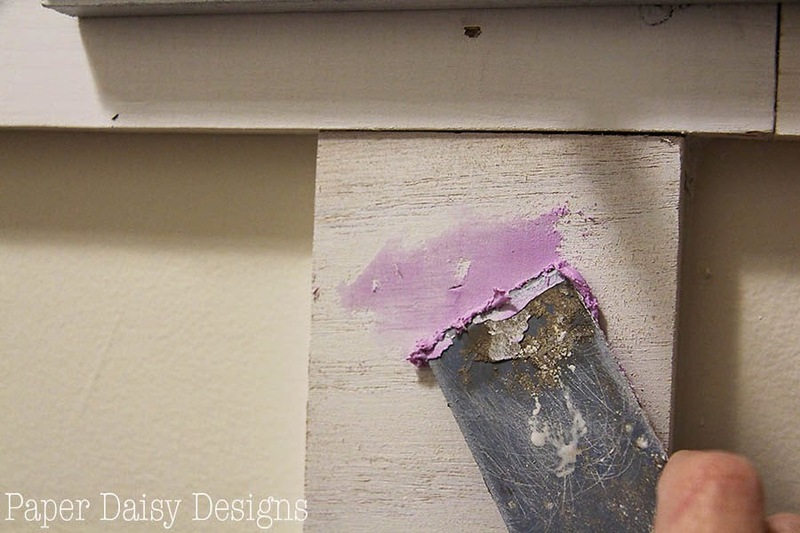 The key to caulking is to use a knife to cut a small hole at an angle. Then using even pressure on the gun with the angled edge against the wall pull the caulk along the edge. 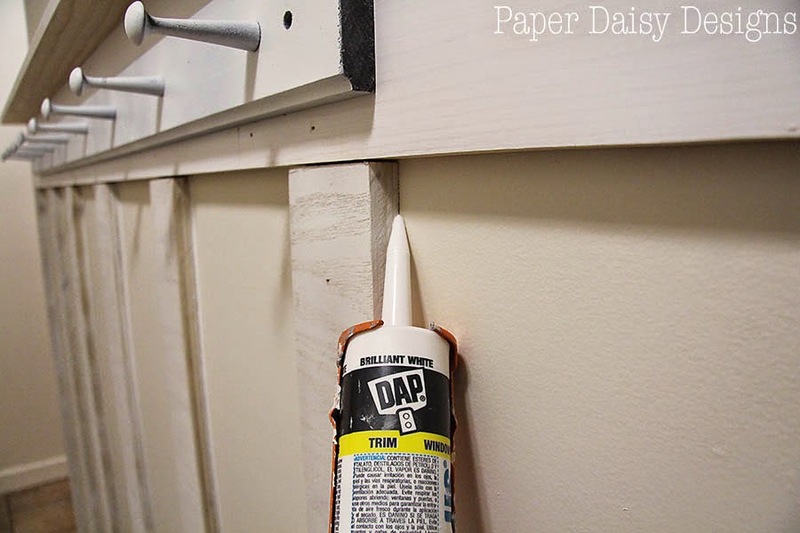 Run you finger along the caulk to smooth out an excess. Keep some paper towels handy to wipe off your finger. 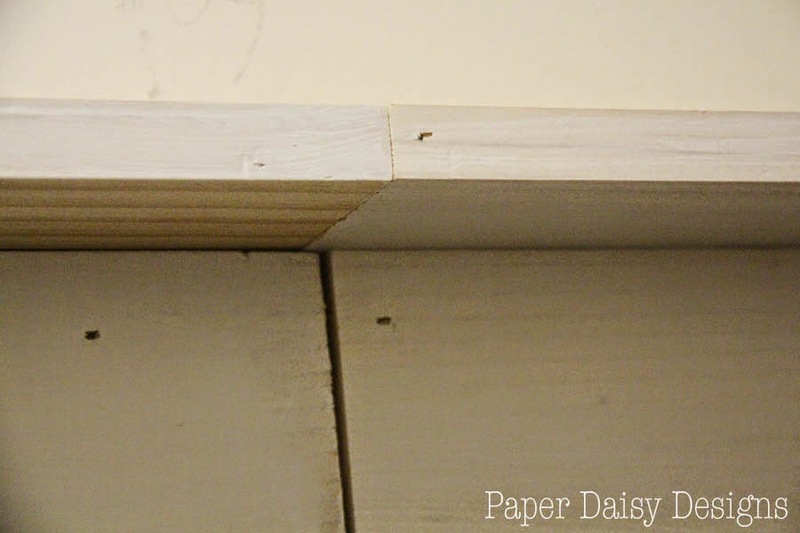 I used wood putty to fill the nail holes and the gaps left where the wood did not meet perfectly. But before I filled the gaps between the boards I sanded the edges down, this made the transition smoother and I could use less putty. 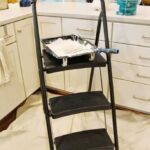 In addition, you will want to sand the edges of your plywood before you paint. The process of cutting them creates a rather rough edge. 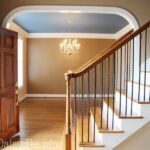 After a couple coats of gloss trim paint we ended up with a completely transformed hallway. To give you a point of reference, here is a look at the before. I thought the previous home owner made a valiant attempt to make this windowless hallway more functional. So much so that I reused both the benches and the peg racks. The benches just needed to be sanded and repainted to eliminate a bad spray paint job. 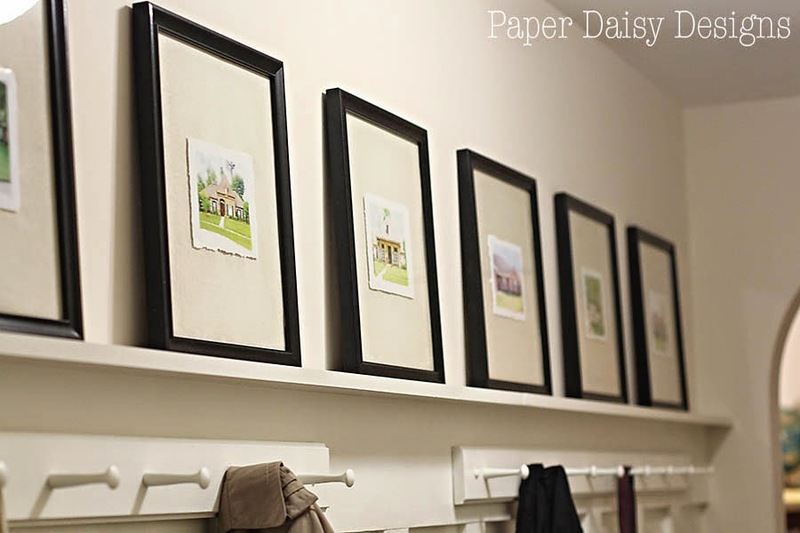 The pegs were not only still functional and once they were painted the trim color they would offer a more seamless approach to practical hanging storage than hooks. Adding crates under the benches for extra storage, a color-packed rug and artwork perched along the top rail, finish the space. Honestly, it took me longer to create the art above the board and batten than it did to build and paint it! It required me to comb through boxes of photos and my digital files to collect a photo of every one of our 7 previous homes. I also had to call in a favor of a previous neighbor and my mother to photograph two of our houses in Louisiana. Thanks Mom & Kelly! Then, for more of an artistic look, I transformed them into watercolor prints. Here’s a link to the watercolor houses post. The project definitely created a more welcoming entry into our basement from the garage. It is the entrance we use everyday and despite being a windowless space, it is now bright and inviting. 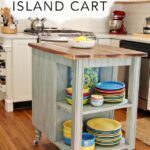 I hope this tutorial gives you the confidence to try your hand at your own board and batten project. I’d like to say it could be done over a weekend, because I think it could be, but our time was fairly disjointed, so I can’t say that with all certainty. To give you some idea, we were able to get the boards hung in under an hour. 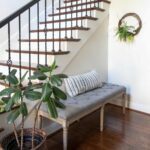 With little effort, it can definitely transform a space by adding dimension and architectural interest with very little investment in materials. 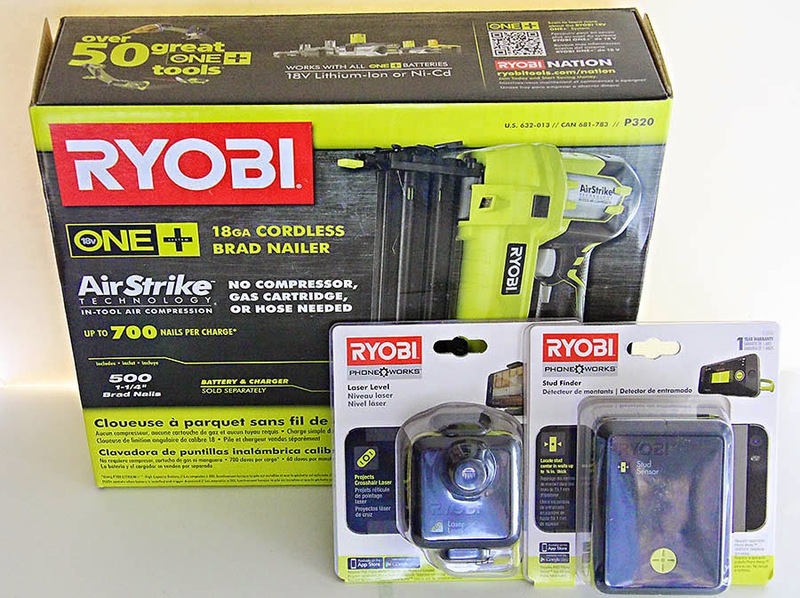 Thank you Ryobi Power Tools for providing us with the 18V One+ 18 GA Cordless Brad Nailer and the Phone Works Stud Finder. All opinions and project design are my own. 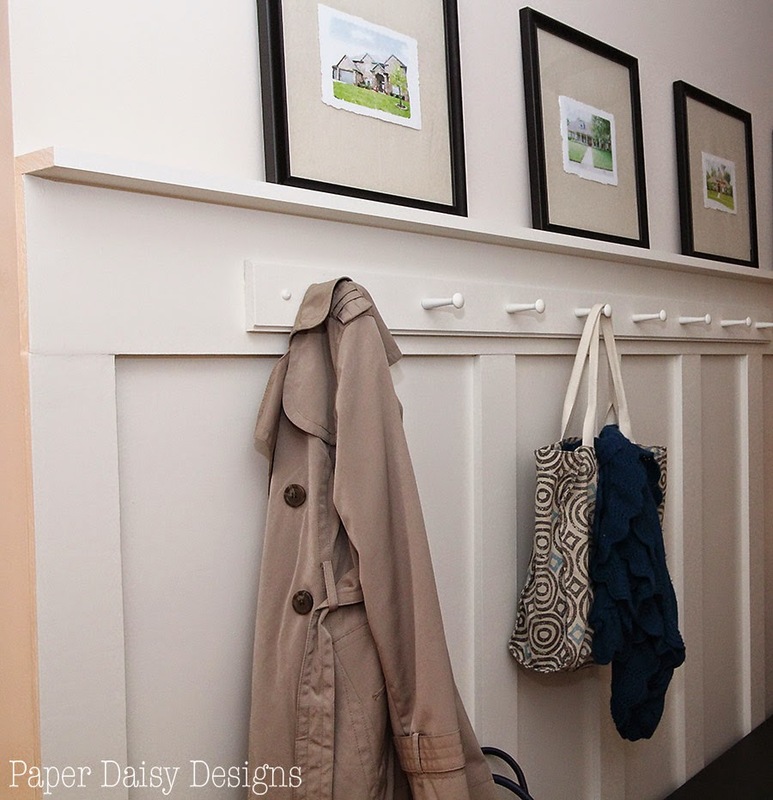 Nice idea for a mudroom! Great step by step instructions! What a beautiful space! 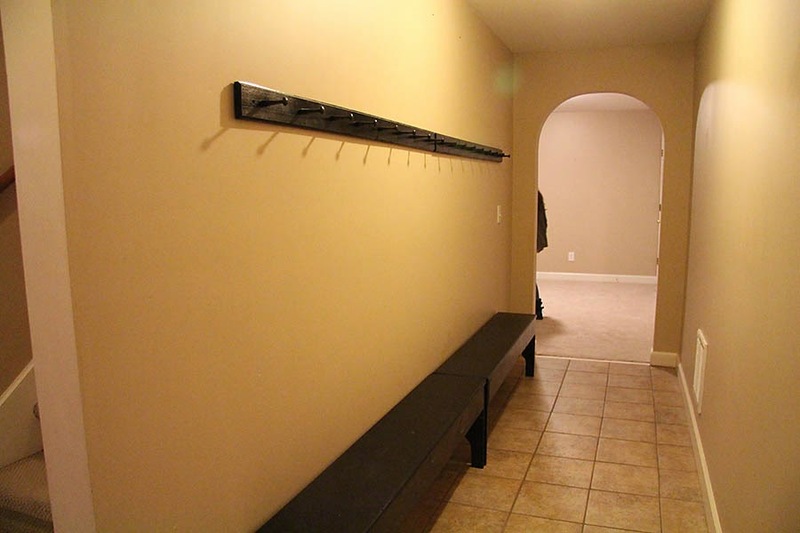 I am DYING for a mudroom/walkway/space we can put all our &quot;stuff&quot;. Gorgeous! These look great! I would love to make them thank you for sharing! This turned out beautiful! 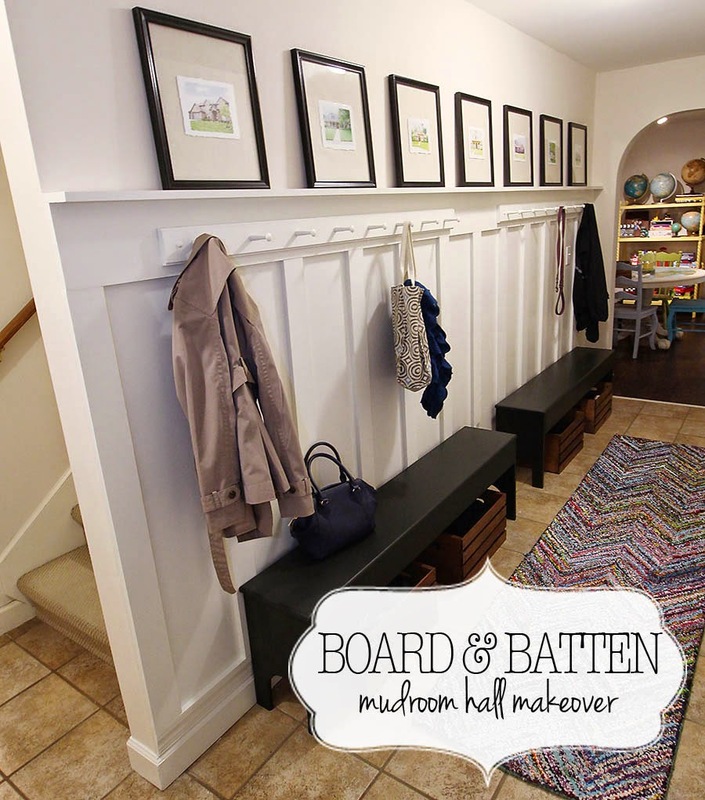 We did a board and batton in our entry too, but I didn’t think about adding another lip to the baseboards. 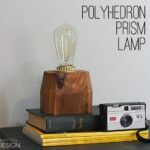 It’s clever and beautiful! It looks absolutely stunning! What a beautiful transformation! Thankyou for the how-to! Saw this from the dedicated house and I love it! It brightened up your hallway so much. 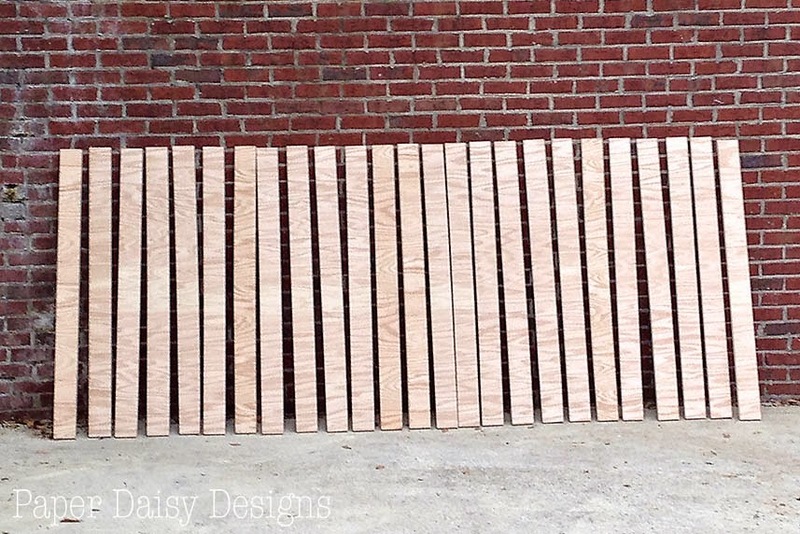 Wow– the board and batten turned out so good!! Looks like such a nice space now! 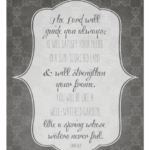 You should join my link party, http://www.carissamiss.com/2015/01/outside-box-no-18.html Love your stuff! Thank you Mary! 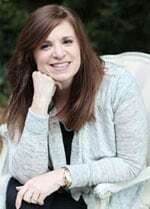 So happy you find the tutorials helpful and enjoy the blog. Here is a link to the rug. The photo on my blog is a better representation of the color than the photos on their web site. I know it’s been a few years since this post, but where did you get the benches?